A very interesting and complete introduction to ancient lamps. An introduction about lychnology in the Holy land based on artefacts from the Adler collection. The Nakayama & Orsetti ancient lamps museum. Website of a huge japanese museum dedicated to lamps through history (in Japanese). 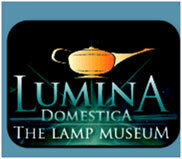 A huge lamp museum opened in Bruges (Belgium).